In partnership with Roses’ biographer Simon Spence, we are proud to present a comprehensive series of interview transcripts from those closest to the band. 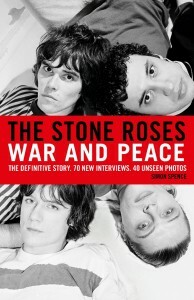 The Stone Roses: War and Peace biography is based on 400 hours of interviews with over seventy of The Stone Roses’ closest associates, including six former band members. More than 100 interviews went into the making of War and Peace. Often these interviews would run, when transcribed, to over 10,000 words. In the writing and editing process, many details, insights and whole episodes from these transcripts had to be axed to keep the narrative pace of the book moving. Here, is the opportunity to publish the basis of the book in its purest, simplest form: the full transcripts of the interviews – Simon Spence. First in the series is Dave Roberts, A&R at FM Revolver. The FM Revolver record label released the early Roses’ single Sally Cinnamon. Later transcripts will feature Howard Jones, Pete Garner and Geno Washington amongst others.